Kristen once took a very serious career assessment test that said she should be a doctor in whimsical nonsense and tomfoolery, and suddenly her path in life was clear. Kristen completed the curriculum at Washington Improv Theater in 2018. She has taken other workshops and electives and has also studied at iO Theater in Chicago and Dojo Comedy here in D.C. She performs on the indie teams 37 Puppies and Milk on the Rocks and can also be found indulging in her other passions: sketch comedy and musical stand-up. She is also a published satire author. Someone once called Kristen a unicorn because she is from the D.C. area–Waldorf, Maryland, specifically–and people in D.C. who are from D.C. are rare. When she is not improvising, Kristen plays the piano, enjoys learning about space exploration, and says “Hi, puppy!” to every dog she encounters regardless of their age. She also loves sports and, despite her Maryland roots, is a fan of the Cleveland Browns. She is excited to see if the statement “The 2019 Browns look like a playoff team” ages well. One night in April 2017, Kristen asked Google where she could learn to do improv in D.C. and the rest, as they say, is history. Kristen moved from Maryland to D.C. in December 2016 and WIT has made her life here more fun and fulfilling than she ever imagined it would be. 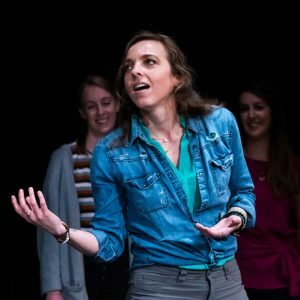 She first fell in love with improv after a WIT Improv for All workshop and her love for it grew with each class she completed in the WIT curriculum. She is happy to volunteer her time and energy for an organization that brings so much joy and laughter into her life and to so many others in our city. She also loves making friends, seeing shows, and using her organizational skills to support a good cause. Kristen is a government analyst by day but she once took a very serious career assessment test that said she should be a doctor in whimsical nonsense and tomfoolery, so she works in that area on the side. She loves writing, playing the piano, and sports — especially the NBA. She performs with the indie team 37 Puppies.